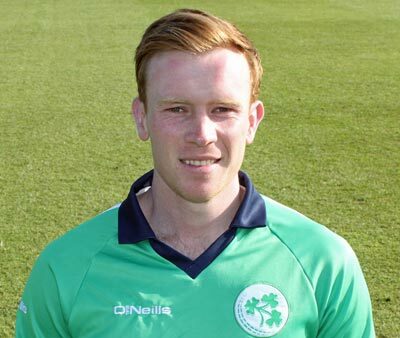 Shane Getkate became the 700th men's cricketer to represent Ireland in the win over Oman. We take a look at some of the others who reached significant milestones. Edward Liddle had written many biographies of the 700, and we look at the highlights from them in these synopses. 1. John Coddington was the first to be capped by Ireland back in 1855, going on to play nine times in total - including three matches involving more than 11 players. He came from a wealthy family, and he could well have needed the money, having been married three times, and fathering the last of his children when aged 70! 100. Charles Edward Stelfox won his solitary cap in 1867 against I Zingari. He's described as "The first great Ulster batsman. Known as a ferocious hitter of the ball, he was a player of moods. He sometimes appeared casual, which exasperated his many supporters, but dashing and debonair, his brilliant strokeplay excited crowds at North for more than a decade." 200. Thomas Perrott Dublin solicitor Thomas Perrott won his solitary cap against I Zingari in 1888. He took seven wickets in the match and can be considered unlucky never to play for his country again. In the 1901 census he was shown as living with his Trinidad born widowed mother and three younger spinster sisters, but married in 1903. 300. Desmond James Murphy was another one cap wonder, playing against Scotland in 1920. He didn't have the greatest of games, making a pair and taking no wickets. He was a schoolteacher who went on to progress to a headmaster in Bray. 400. Jim Graham was a very good off spinner, operating at around medium pace, who would undoubtedly have added to his total of seven Irish caps had be not been a contemporary of another practioner of the " offie" art, one JC Boucher. Nevertheless his figures for Leinster between 1925 and 1940, while they do not surpass those of Boucher for Phoenix, are remarkable enough in all conscience. He took 496 wickets at 11.35 in senior cricket in Dublin, with 43 "5 fors." He passed the 50 wicket in a season mark on four occasions and had a number of really outstanding performances which clearly prove his worth. His seven matches for Ireland played between 1936 and 1939 saw him take 14 wickets at 30.21 with a low economy rate. His best match was his debut against Scotland at Raeburn Place. He was one of only three Irish players, the others being Eddie Ingram and Charlie Billingsley who could take any satisfaction from a match in which Ireland were defeated by 214 runs. James Robert Graham's Irish career was curtailed by the brilliance of his contemporary JC Boucher and by the onset of war. Illness and premature death were to end his club career but he retains a high place in the annals of Leinster cricket. 500. Conn McCall was a sound opening batsman, who was a prolific scorer at club level. He also showed his class in representative cricket, without quite achieving the consistency that his ability warranted. He played 15 times for Ireland, scoring three half centuries against MCC (twice) and Hampshire. Conn was to become a leading administrator, being Northern Cricket Union Executive Committee Chairman in 1984 - 85, an Irish Selector 1981 - 1986 and, a well deserved accolade, President of the Irish Cricket Union in 1992. Away from the cricket field, Conn was a good rugby full back, in the days when No 15s were not expected to double as wing three quarters famed for his long, raking touch finders, he was also a highly reputed goal kicker. He was, of course, later to have the pleasure of seeing his son Mark gain 13 caps in the centre for Ireland between 1991 and 1998. 600. Peter Davy won 44 caps between 1995 and 2002. The Pembroke batsman - twin brother of John - made an inauspicious start on debut, failing to score against Scotland when aged 21. He scored exactly 1000 runs for the Irish, which included two hundreds against MCC and Canada. He was part of the Irish squad for the 2002 European Championships, but failed to sparkle and soon found himself surplus to requirements as new head coach Adi Birrell rebuilt the squad.